So, the original color of this cars interior was red. It is currently this ugly tan (With the seats being from and Olds Alero or Intrigue (one of the two) and they don't match the interior color. My father and I are thinking of either returning the car to Red or having it Black. The current finish of the car is black. The original color was silver with two red racing stripes. This is tough. I'm biased towards red interiors, but the tan looks really good. Really? I think it looks terrible. I don't know there is just something about it that I don't particularly like. Part of me says go with red because it's original-- however, I think the black would be slick so I think my vote is black. The red is just so, well, red! If you are going to completely change it, why not do it custom? i also think the tan seems good. i say no to completely red. all black or as mentioned black with red accents/piping/stiching. I like the tan because I'm used to my car BUT I do have to say either red or black w/ red accents would be very cool! IMO returning old cars back to stock is always the best way to go. I agree, but if you note in his first post, the stock color of the car's exterior has already been changed. Therefore I'm not too worried about keeping this particular car stock unless they decide the paint the exterior back. I'm a purist but as long as he's enjoying his car, that's what matters. As I previously stated I think black would look good, though this talk of black with red accents also sounds good! We should get a photoshop going to see what these red accents would be like! I vote either all black or black with red accents. I know a guy with a 72 Monte Carlo (quite a bit like this body style) and it's got all black leather interior, all black exterior with red flames on the hood. It looks sick, I vote black/red accents all the way, only because of seen cars of the style with that color scheme and it looks AWESOME! 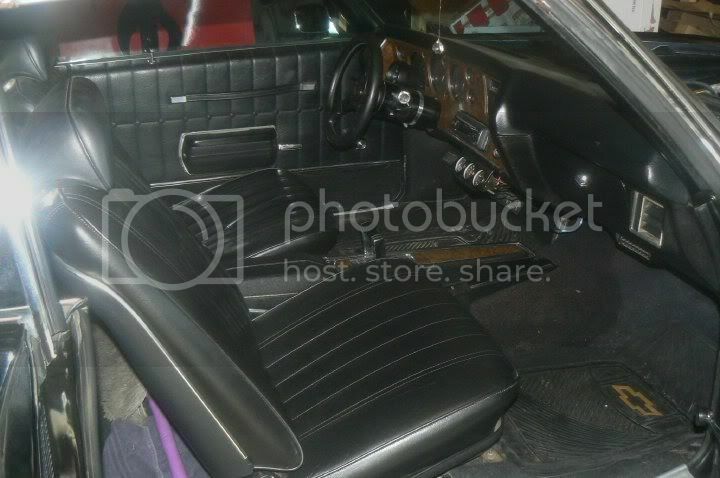 So my father and I found some black leather seats from a '76 Ventura. My rear seat is cracked so we are also going to reupholster it black. I did some thinking and I really think it would look neat as black with (Blue) highlights. I would also change the red pinstripe to a blue of the same color. Below are some photo-shopped images to give it a blue pinstripe. I personally think it would look really cool. I think the red pin stripe follows the car better, the tail lights stick out a lot and are red (so is the Pontiac Racing decal on the window) just follows nicer. I'm not one to knock black and blue though, good combo. 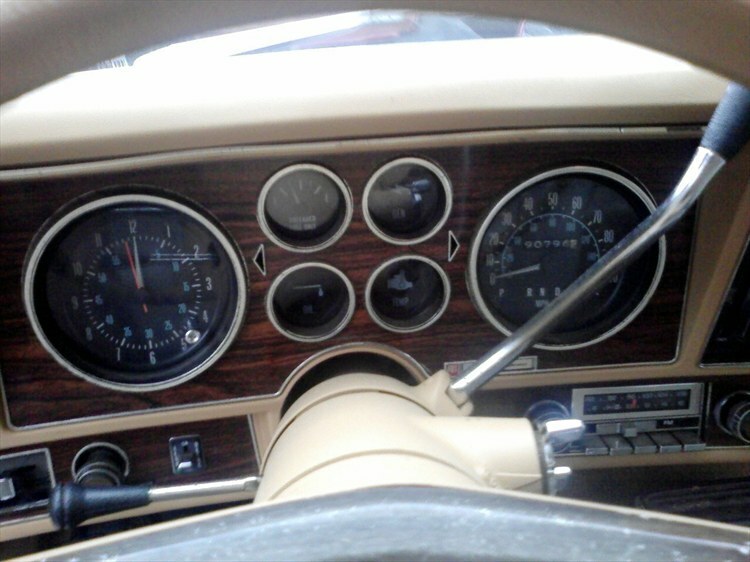 My Black and Gold Trans Am has a matching beige/tan interior, so I would say I am biased towards the current interior or red. Black interiors are nice but the car can get a lot hotter in the summer with a black leather or vinyl interior. It looks killer but it is a tad warmer on the backside when you first get in the car until the AC gets going or you get the windows rolled down. I also realize that some window tinting would also help, but you have to be aware of how much tinting is legal in your state. Now if you are going to stay with the black interior, red piping on the seats and door panels and a matching red exterior pinstriping would look good, it would break up all the black (inside and out) nicely. Blue is a good choice, but you have nothing else within the car to tie it too. Plus the shade of blue against the black is key to making it stand out. As it was stated before, the red window decal, tail lights and pinstripe all help pull the red look together. You'll definitely notice a black interior (or dark interior) vs. a lighter colored interior. My '95 Monte is black leather and especially in Florida it is a pain. One of the reasons why I have a tan interior in the 6 now. Well yeah. I see his point now about blending it together. I live in Massachusetts so I have cold winters and warm summers. I've been in a black leather interior car in the summer, its not THAT bad. It was my mothers black Infiniti G35x. I have never had an interior NOT be black and I'm in SoCal, not unbearable. Black interior are the best! Tan gets dirty too easy. Tell me about it... My interior is dirtier than rice rocket at a rally race. Nothing shows dirt like a white interior. Beleive me, I know. I'd rather deal with a tan interior. At least some of the dirt appears to blend in. On the other hand, nothing shows road dirt. dust, and grim like a black car. Beleive me, I know. I've had 2 black/gold Trans Ams and a black S15 Jimmy.